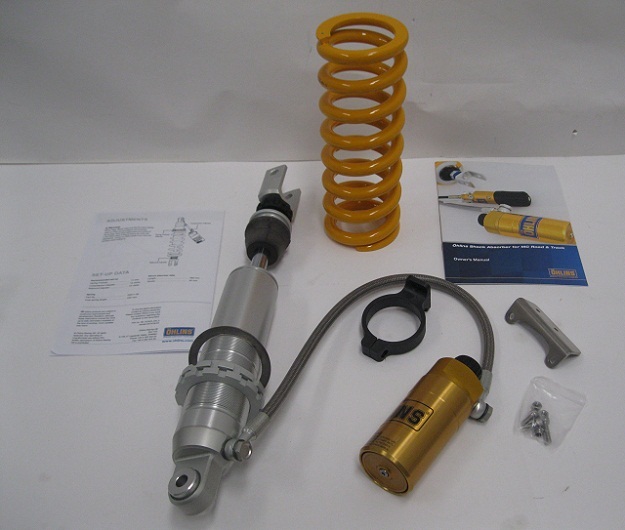 Ohlins has a fully adjustable shock with a better spring than stock (and with spare Extra heavy duty spring for even more loading and chubbyness) an Ohlins air bleedable fork cap(s) and (2) fork spring kit , a better rate than stock and spare heavier than that. 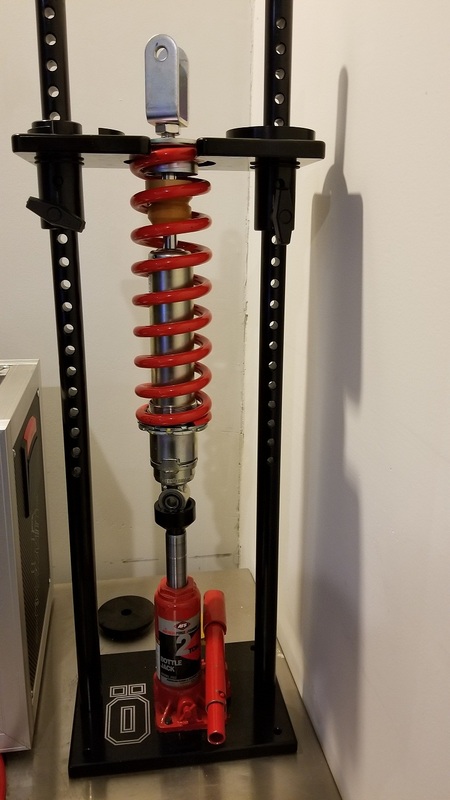 The fork springs that actually fits! 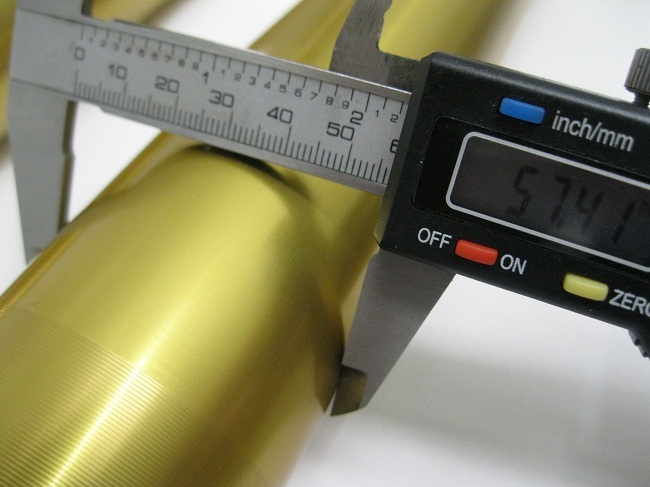 the way it should true to length without goofy spacers or tubes like previous cheezy brands and others offered!. 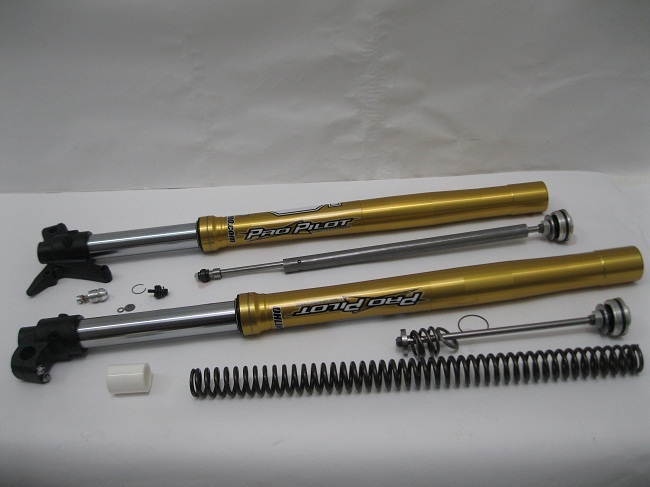 Ohlins makes a fully adjustable shock very heavy duty with a 46mm extra large body and 16mm extra large heavy duty shaft, Ohlins Fork springs that actually fit well true to length and Cap kit . 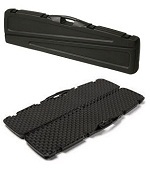 Note: this is not a product that can be ordered out of the catalog by a part number at this time subject to change. 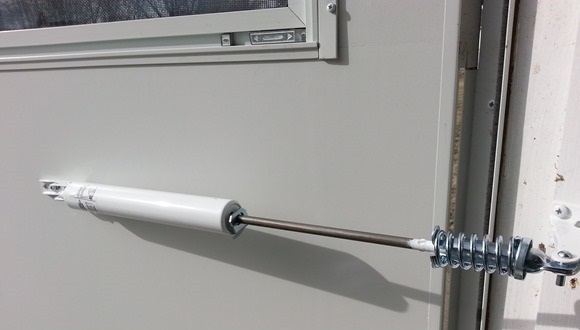 A Universal design 4 port 20m piston with rider specific custom updated valving shims stack with optional valving / Piston(s) kit for fork works very well and is a in house supplied product only. 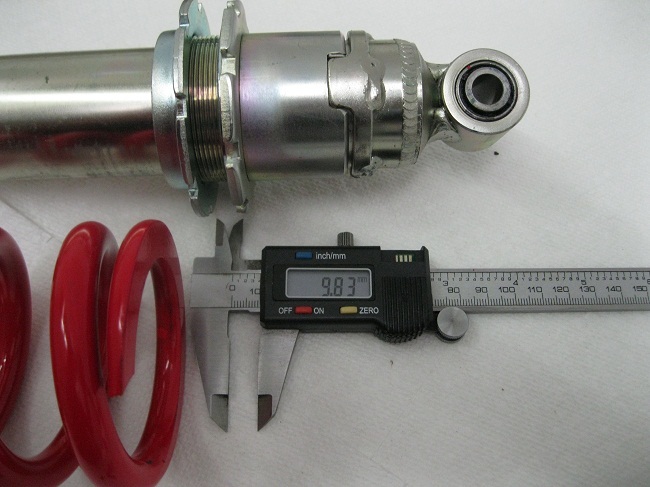 They are small with only a 40mm body and whimpy shock shaft,etc. 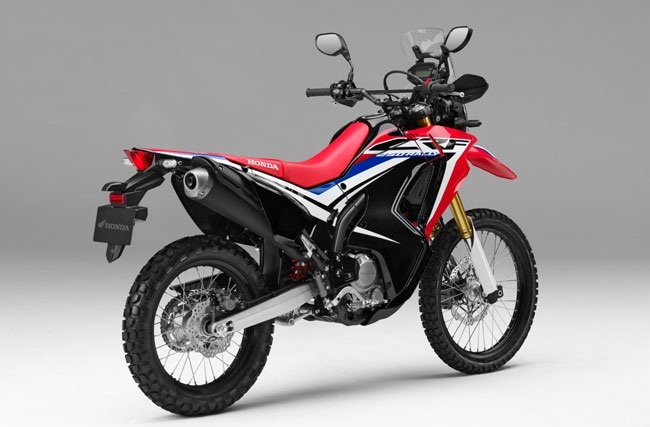 Honda CRF250L Rally 2017-On, cool bike but Super Soft Super basic suspension that includes a hopeless shock. 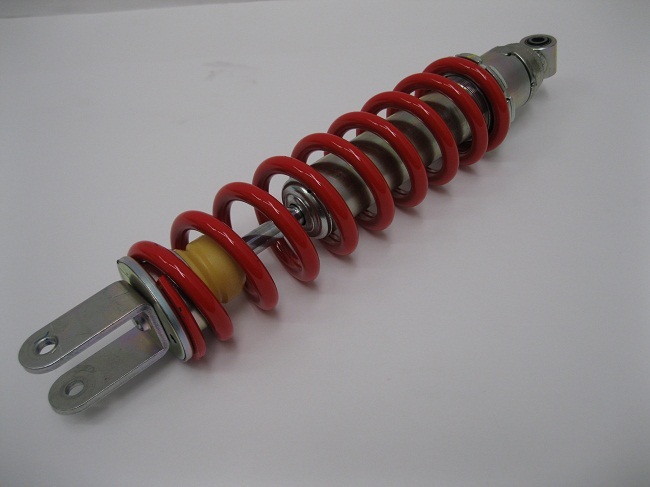 ALL New Super high quality Ohlins S46HR1C1 shock, SUPER big and fat 46mm body heavy duty 16mm shaft! 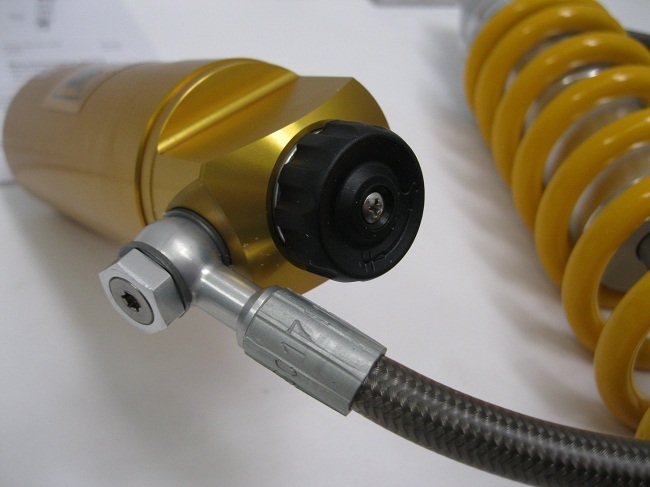 Fully adjustable compression (approx 25 clicks) and rebound adjustable (approx 50 clicks) sprung and done to your door with 95mm Adjustable threaded preload on billet Aluminum Ohlins quality hard anodized shock body. 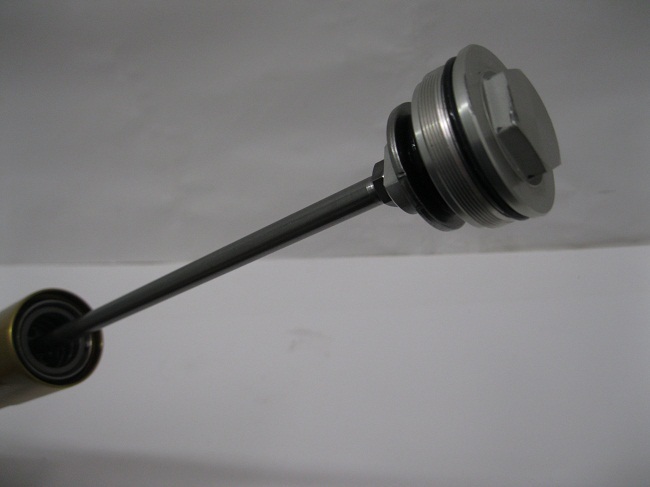 Divided fluid and nitrogen with internal floating piston within remote reservoir, fully rebuidable for many years, revalvable and tunable. 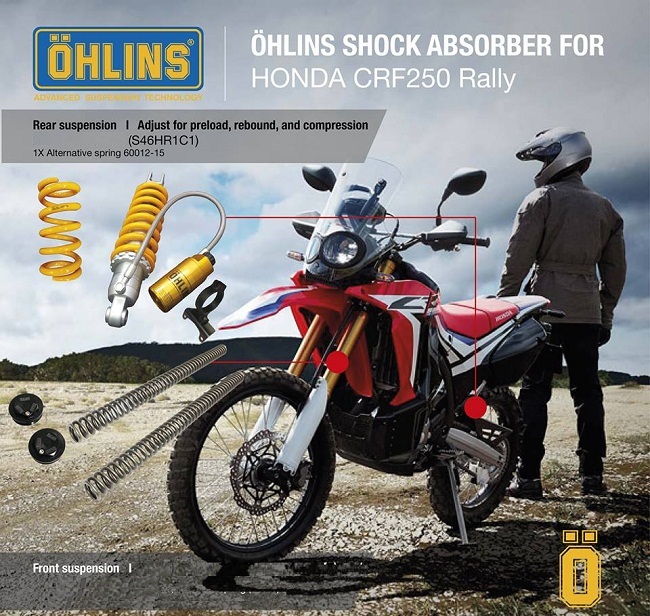 Ohlins has the best shock for the money, quality and durability with over 40 years building shocks all over the world for many applications. 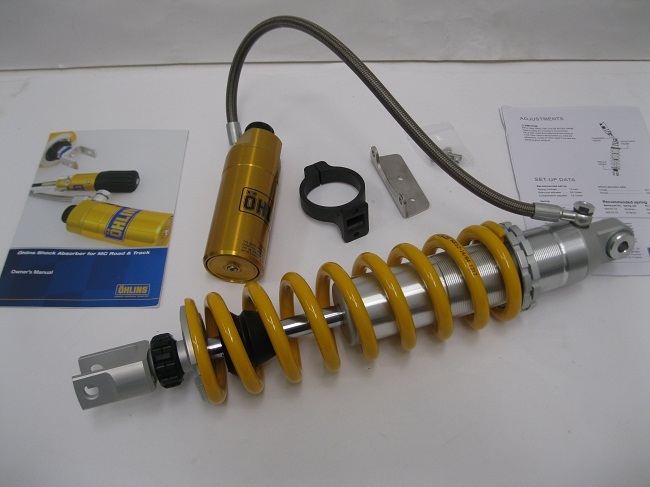 The Ohlins shock has a heavy duty oversized 46mm body and 16mm shaft with fully adjustable compression, rebound and spring preload. 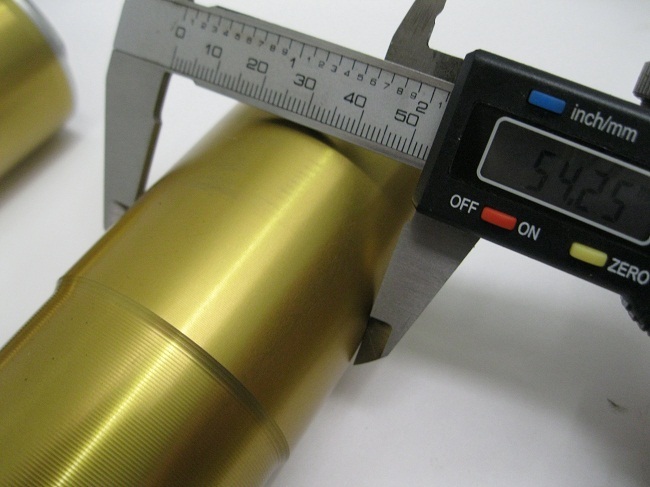 The fluid and nitrogen are divided with an internal floating piston within the gold reservoir for fade free performance and extra capacity. 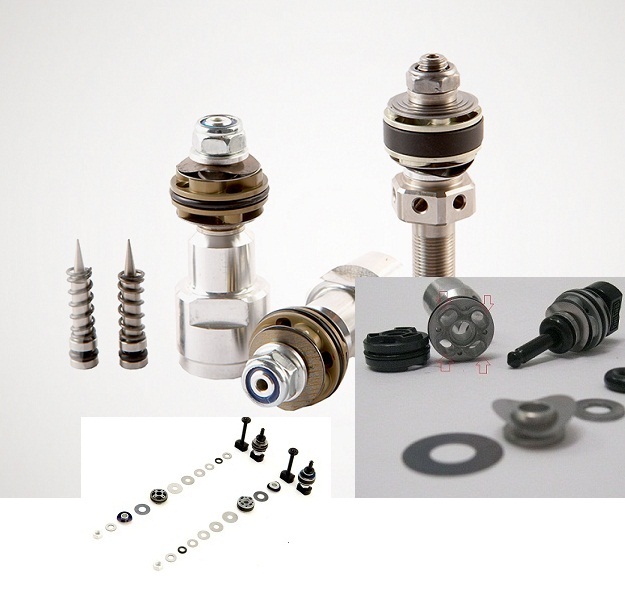 Fully rebuildable, revalvable for many years. 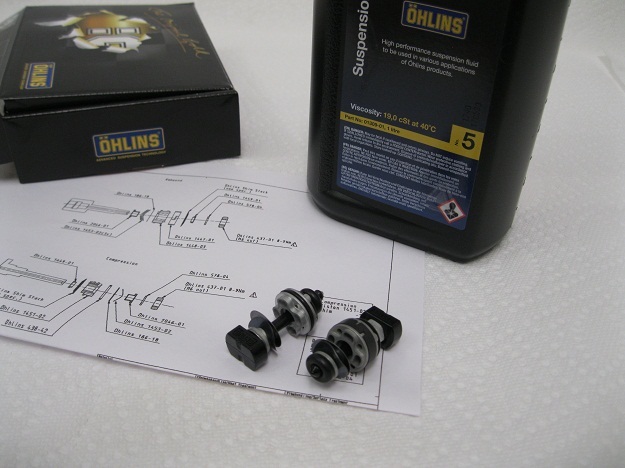 Above Ohlins integrated spring preloader option, easy to get to with 8mm drive with “T-tool” (not included common stuff) changes spring preload about 10mm more or less from original set position range. Sweet looking bike but with super soft and economized shock and fork. 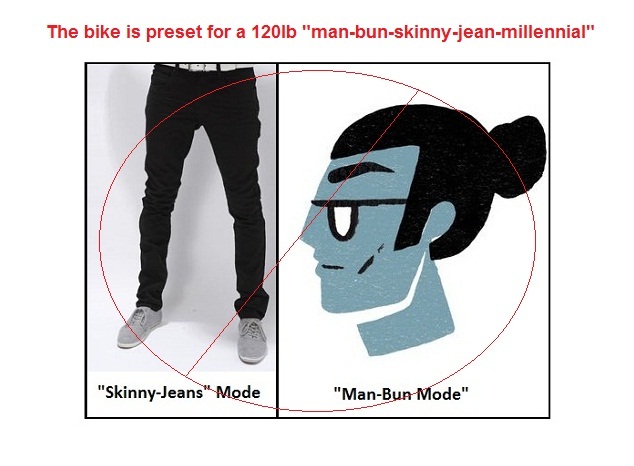 Super skinny people only unless you swap the shock and fork stuff to get you in the game. 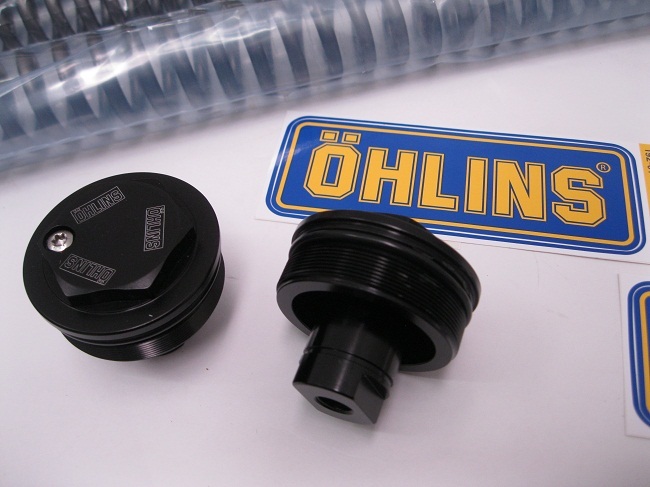 See super cool Ohlins Caps that allows for “air bleeding” to equalize any built up air pressure before each ride like modern motocross forks. 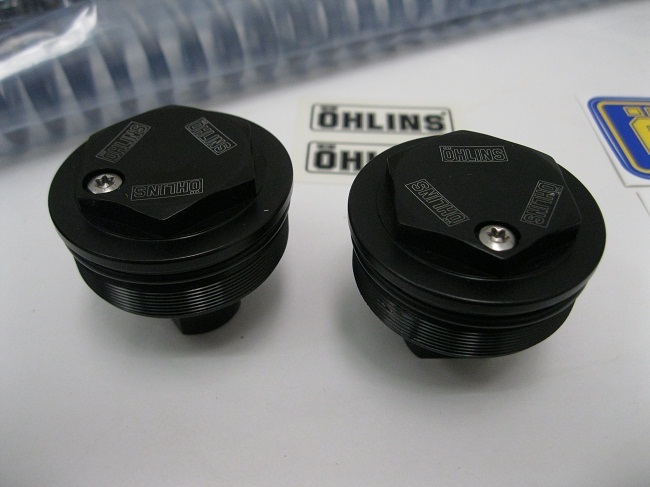 Ohlins caps sold with kit have “air bleeders” (those little removable bolts) that are for equalizing any air build up like MX / Enduro long travel forks. 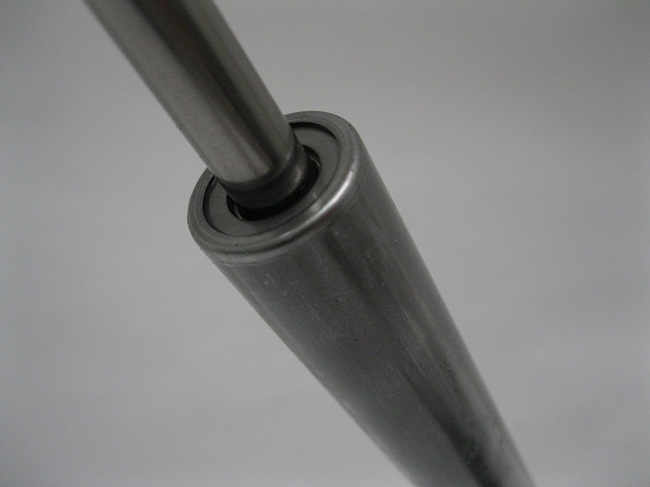 By equalizing the air before each ride with forks fully extended , this will provide a much improved ride, save seal life and help the overall performance and balance. 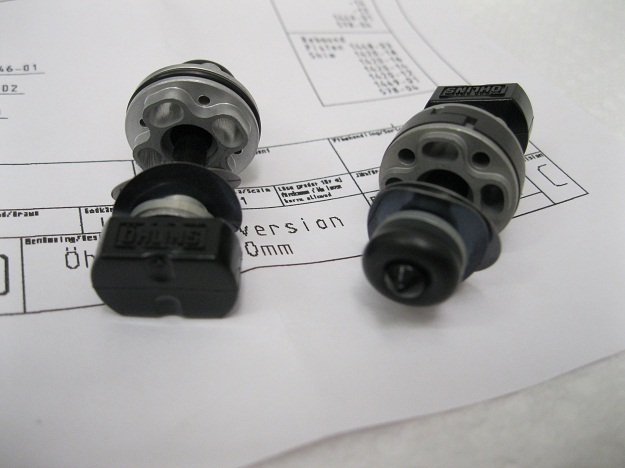 Above Valving and Piston kits for Offroad and heavy loading can be tuned for rider weight and conditions from street to full offroad, these update your 3 port stock pistons from the 1980’s (See below…). 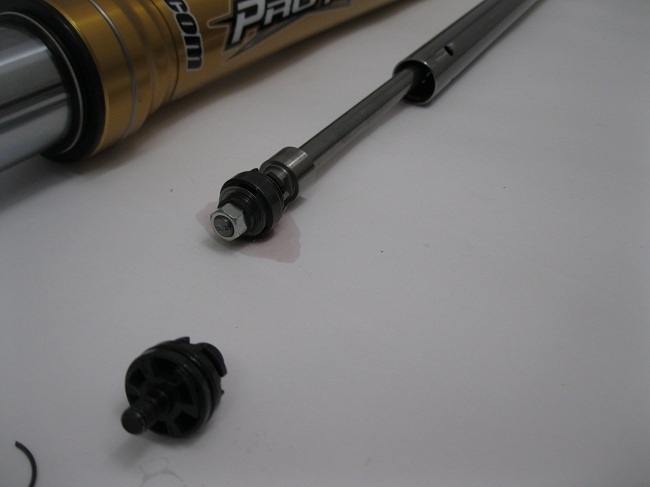 These help in any conditions from commuting to real offroad settings over the stock fork pistons. 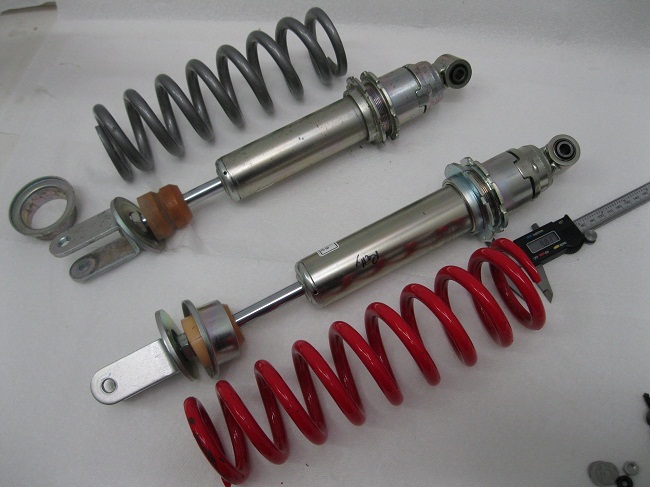 Above the stock CRF250 Rally throw away shock. 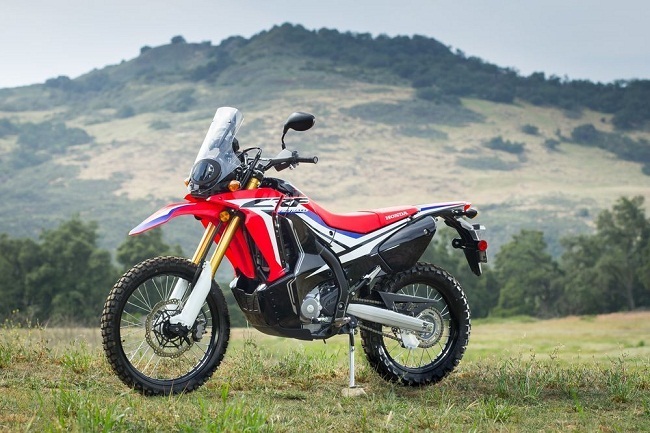 The stock 2017 Honda CRF250L Rally shock vs the regular CRF250L. 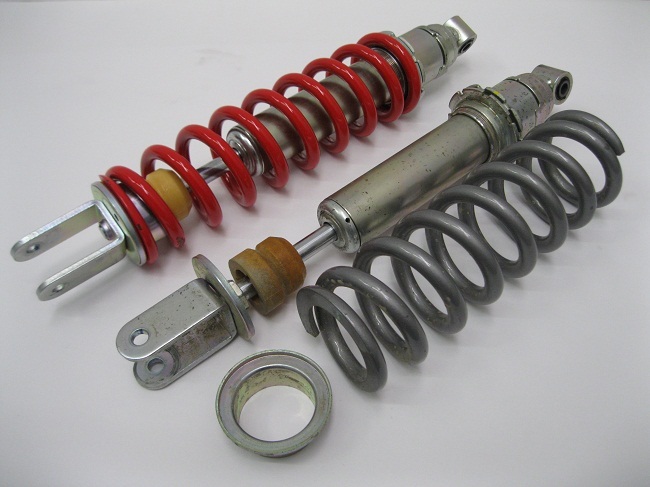 Above CRF250L shock and Spring vs RALLY shock and spring, two totally different shock lengths, spring lengths and spring rates. Another issue on both is only minimal preload range to work with it addition to what is pressed on. 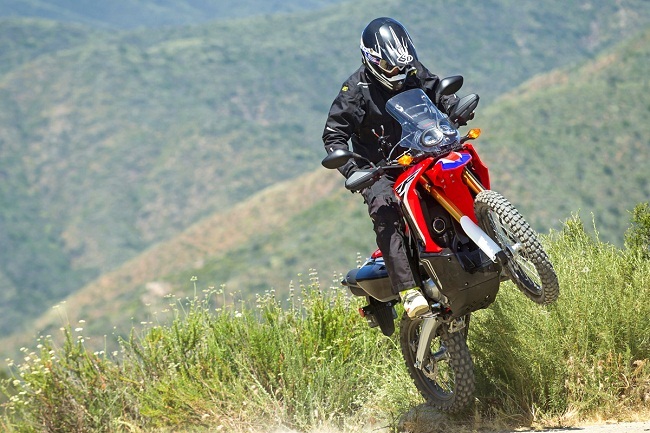 Modest suspension upgrades go a long way to improve the range of use for the Honda CRF250L Rally. 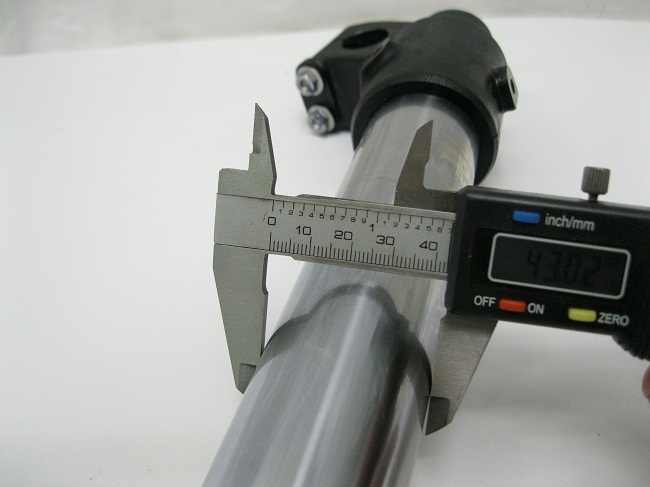 Above the 43mm USD stock Forks Honda CRF250L Rally. 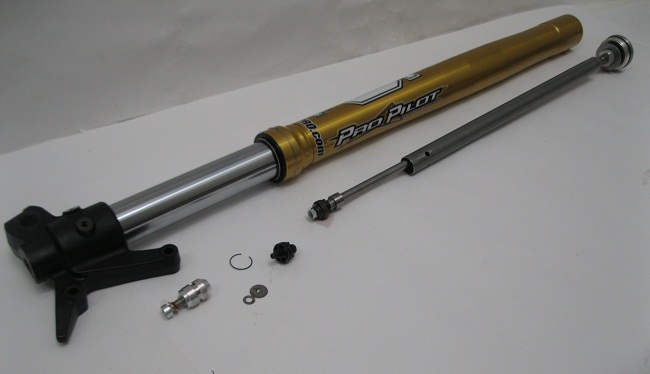 The standard forks are non externally adjustable and no way to release or equalize air build up either like traditional long sweep off road forks. The standard spring side leg. 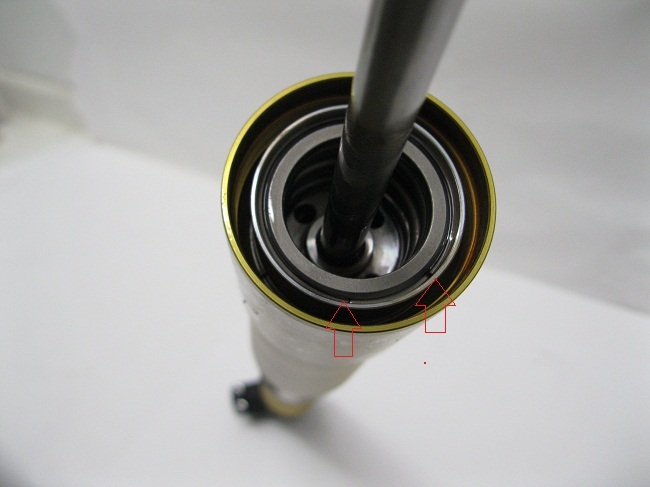 Above this side is where you can switch to a 4 port valvable piston kit that works much better. One side has to do the work of two. Note the clip so you can get to the stuff. 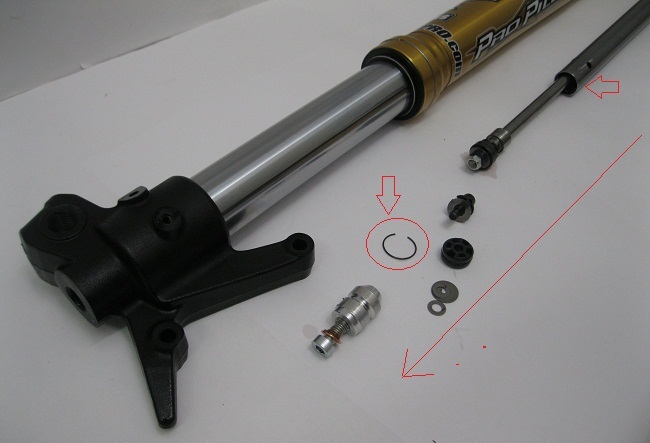 The stock fork 3 port piston is from the late 1980’s appeared in CR stuff. 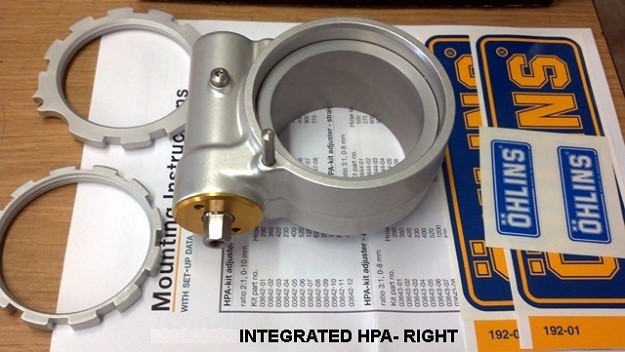 These three port pistons were brand new on the first year production upside down CR250 2-stroke from 1989 over twenty-eight years ago! but they even had 45mm forks. 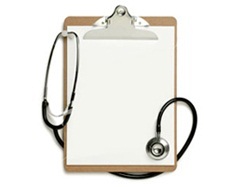 Note: above is not a general listed catalog item at this time subject to change. But the Valving has been changed and updated to suit the needs from 25+ years of doing it. 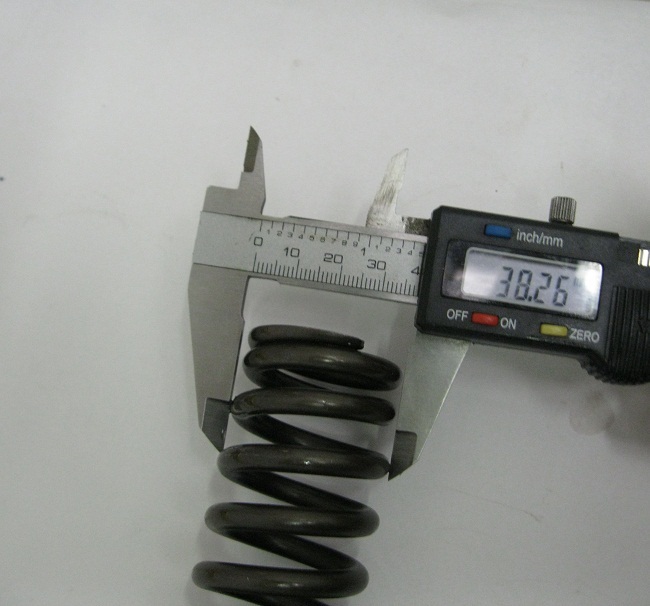 Honda CRF250L Rally fork size and dimensions. 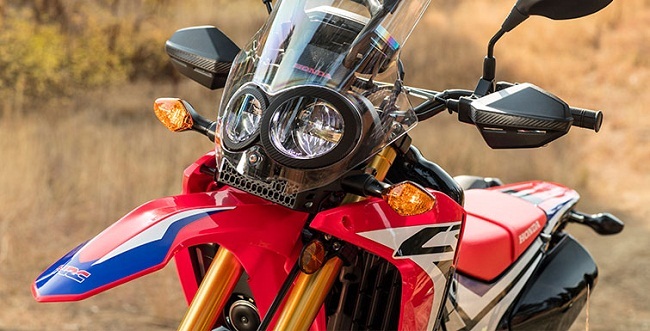 Above is the CRF250L lower fork clamp so you can make a frankenstein mess out of your neighbors forks. 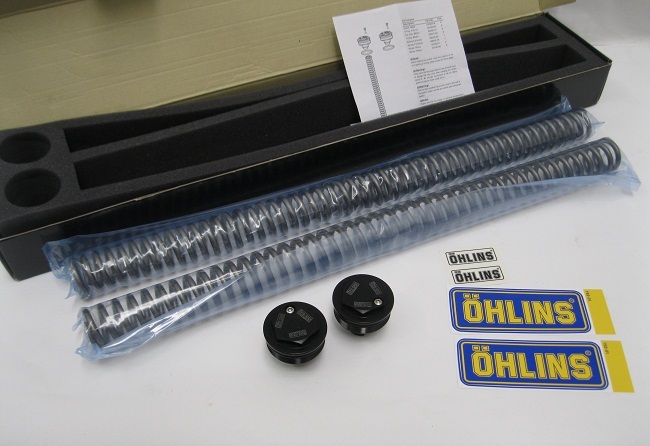 A simple very cost effective solution for the front and rear that transform this bike into something much more capable for the majority or riders and loading made by Ohlins (See Below…). 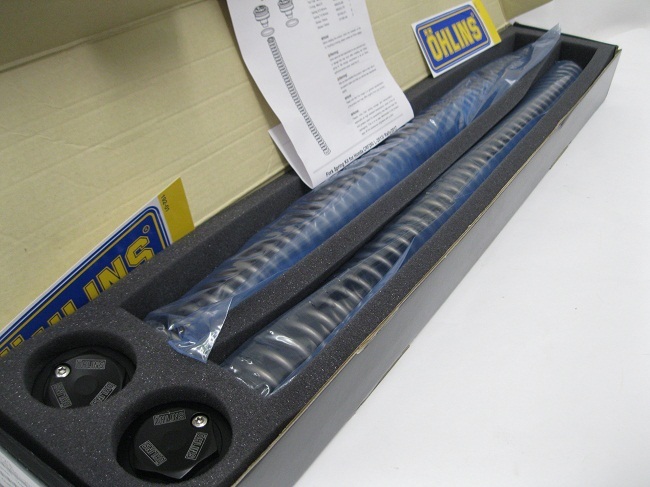 Above Ohlins S46HR1C1 shock comes with optional extra loading spring in addition to the heavy duty spring supplied. 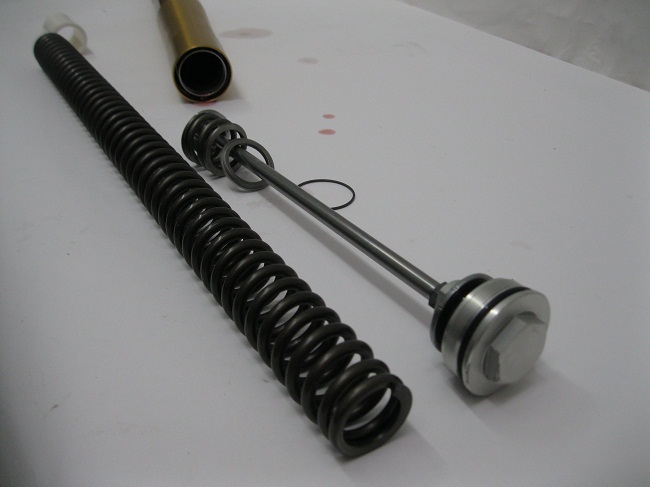 Update- Shown above, a couple years ago now, there is a cheapo-foogesi stuff a spring in one leg option~ Stuff and GO! 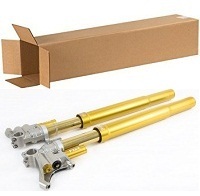 We don’t sell these much but some early on for the regular CRF250L tried some. Add 1 spring and goofy long spacer tube to the Other leg that doesn’t have one and hope for the best! 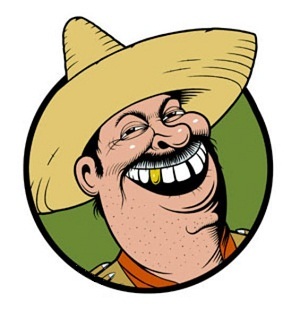 Average the two rates together and what you get? still way to soft ~ And weird.